These two overlap, given that the design of Fennec was itself heavily influenced by point number 1, above. This guide will address both points, in sections 2 and 3, below. There's a mid-sized and furiously-growing body of knowledge about designing UIs for mobile. I've included some links to further resources and some recommended books for more in-depth coverage (see section 2.3), but what follows should get you started thinking about the main issues. There are two major categories of considerations in mobile. Simply, you have to take how both parties in the interaction, the device and the person, are different in a mobile context. The first -- that the constraints imposed by and the functionality available on a mobile device differ from their desktop counterparts -- is probably the more obvious and well-thought-through. The other, that the way that people behave and use technology while mobile is different than while they're at desks, is equally if not more important. A good design for mobile takes both into account. The following is a list of the most relevant characteristics of the current generation of mobile devices. People are different in what they want and do while not in the special-case context of a desk and computer. Here is a quick list, based on a taxonomy from Designing the Mobile User Experience by Barbara Ballard, of some of those differences. People can be on the move - they're already navigating in the real world, and so using the parts of their brains that do help them do that. These are the same parts that help them figure out complicated UI navigation -- they'll be in contention! Fennec's design is the result of applying a lot of what comes up in section 1.1 and some of what comes up in 1.2 (look for more results from 1.2 in the future!). It had to be quite different from Firefox on the desktop, but it also tries to respect the spirit of the desktop design. 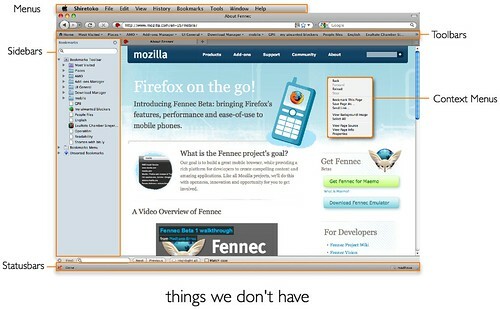 Users coming from desktop Firefox, on encountering Fennec, shouldn't be too surprised about what's there and isn't, what they can expect to be able to do, and how certain key things (bookmarking, identity, tabs, etc.) work. From a practical add-on developer's perspective, the first big question will be "where can I surface my add-on"? You'll want to pick the most appropriate section of the Fennec UI to host your add-on, and that will depend on how and when your add-on is most needed and used. The titlebar is present when the application is first started, and also at the beginning of every new page load, so it makes sense to put things here that are needed at the beginning of a browsing task. It scrolls off the screen as a user pans down a webpage, so it is not a useful place to put items that are needed in the middle of a browsing task. The control bar, just past the right-hand edge of the content area, is home to Fennec's bookmarking and back/forward controls, as well as providing access to the Browser Tools area. The controls in this area are all focused on mid-browsing to end-of-browsing tasks. For example, a user will tend to bookmark a page only one he or she has read enough of it to know whether it is worthwhile. Similarly, a user will tap back or forward once he or she is finished with the current page. If further detail is need from the user, of if there is a short list of options that a user might want to use to further refine an action, you can use a transient popup (similar to alerts, in a later section). 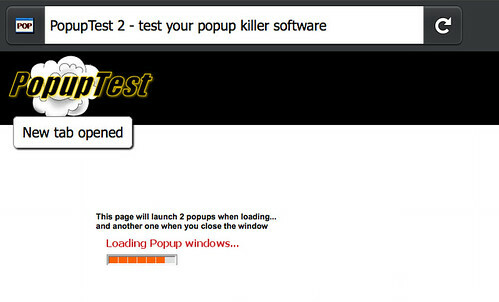 As shown here, in bookmarking, these popups should disappear as soon as the user taps or begins to pan anywhere off the popup. This area of the UI contains thumbnails of all currently open tabs, as well as a button to open new tabs. If your add-on relates to tab management, or if your add-on could live in a permanent tab, you may want your add-on to have a presence here. This screen comes up whenever the user wants to go somewhere on the web. The title in the titlebar is replaced with the URL, which is highlighted to make total replacement, rather than URL editing, the easier option. A list of awesomebar suggestions is presented, and this list will update with refined suggestions as a user types. The first item in the list provides access to the user's full list of bookmarks. Finally, across the bottom of the screen is a list of search buttons, to which the user can add more. If your add-on adds context to the awesomebar, helps users enter URLs, provides navigation suggestions, or is at all related to helping with the task of going to a site or searching, this is the screen to consider. This section of the UI contains Fennec's three "managers" -- add-ons, downloads, and preferences. Web-content is offscreen when this area is visible, which is why only functionality that does not relate to what's going on in content is here. If your add-on provides function that does not related to which page the user is currently on, this may be a good spot for it. Use a notification bar to ask the user a question related to the site that he or she is currently on. In other words, if the browser or add-on is helping the user to control his/her interaction with a site ("will you allow this site to install software?" or "can this site know your location? "), then a notification bar is the UI component to use. They are attached to the titlebar so that the user knows who he or she is being asked about. Notification bars will persist, so the user doesn't not have to make a decision immediately. Try not to use notification bars to give the user information that is not related to current site (i.e. browser or system upkeep questions), or that does not _require_ user feedback. To communicate a bit of information the user may find helpful, but that does not require user intervention, use an alert (next section). These are transient (they pop up and go away on their own) information boxes that Fennec uses to communicate things that the user should know, but doesn't necessarily have to make a decision about. Some examples: new tab opened in background, download started/complete, add-on installed, new update available. They typically are also used more for messages about the browser or system, rather than about the page the user is on -- for the latter, especially if some action is required (block a popup? remember this password?, etc. ), use a notification bar because it is attached to the site-identity-containing titlebar. If an alert is related to something that is situated in a particular place on a sidebar (tab bar or control bar), try to line the alert up vertically with that thing. Examples: "tab opened" is aligned with the opened tab thumbnail; alerts relating to the add-ons manager, downloads, or prefs are aligned with the Browser Tools button in the control bar. Use a symbol/icon to associate the alert with the button or area it refers to. This panel is displayed when a user taps on the favicon (or Site Identity button) next the address bar. It's purpose is to provide more detail and options related to the page the user is viewing. By default it shows security information, controls to add a search providers and clear site-specific preferences, and commands to share, save, or find within the page. Add-ons can use the site panel to display additional information or actions related to the current page. For documentation see /Site Menu. 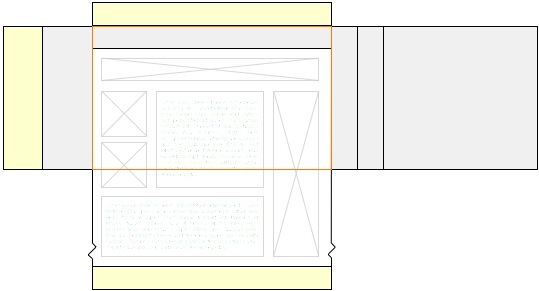 The context menu appears when a user does a "long tap" (touch and hold) on a link, image, or other page/UI element. Add-ons can add new commands to the context menu. 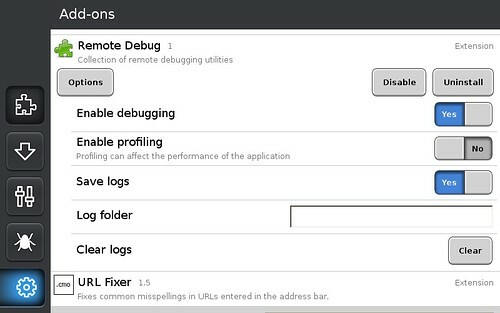 For documentation see /Context Menu. That's fine if you're creating something from scratch, but what about bringing your desktop Firefox add-on over to Fennec's different UI-space? What if you're using application menus, toolbars, sidebars, or status bars? Fennec doesn't have any of these! It's helpful to think about what these areas tend to provide, and then look for ways to accomplish the same ends with the tools that Fennec provides. Sidebars -> permanent tabs? The idea behind sidebars is to provide ambient or close-at-hand access to persistent (list of bookmarks, notes) or updating content (like a twitter feed). On a small screen though, keeping it on-screen isn't really an option. Close-at-hand, though, is an option -- and it turns out we already have a handy mechanism for quickly switching between sets of content: tabs. quick access to sites -> awesomebar screen Quick access to a site is what bookmarks are for; if your add-on, as part of its set of function, also adds quick access to a site, consider making it a bookmark. Ambient indicators -> alerts When something happens/changes that a user is going to want to know about, careful and restrained use of transient alerts could work. The alert can point to something more detailed in another part of the UI. Or better, ambient indicators -> peek indicators?" Because you can pull slightly past a page edge but stop before fully committing, at which point the page edge snaps back into place, users can quickly peek past the page edge to check on things that are just out of view. The mockup above shows a scheme where users can peek at a badge on a tab thumbnail to, for example, see if there are any new messages in his or her webmail or tweets in twitter. Then there's the question of number of prefs. Keeping the list short is hard to do, but it's even more important on a mobile device's small screen than on the desktop (where we could all do a better job anyway). Many times, something ends up as a user preference because the designer couldn't make a decision about what the default behavior should really be. Make the effort here -- think about what your user is trying to do and then make a good choice on his or her behalf; if there's really a split amongst your users about what a behavior should be, you'll hear about it . If Fennec can do it, so can your add-on! 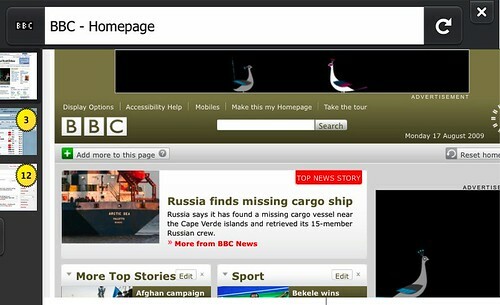 This page was last modified on 27 August 2011, at 18:08.